Weighty Matters: Should Ontario Provincial Police Really Be Handing Out Candy to Children? Should Ontario Provincial Police Really Be Handing Out Candy to Children? 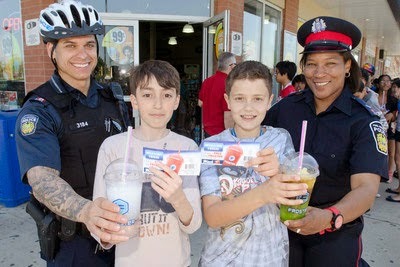 Since 2010 the Ontario Provincial Police (OPP) have partnered with Mac's Milk convenience stores in what the OPP call a "positive ticketing program". The gist of the program is simple. Police give out "positive tickets" to reward good behaviour and/or influence desired behaviour - and generally they give them to children. Since 2010 they've given out somewhere in the neighbourhood of 500,000 such tickets. But they're not really tickets, they're junk food advertisements. Only they're not just junk food advertisements, they're also junk food coupons. They're junk food coupons that entitle the recipient to a free 710mL Mac's Milk Froster (their version of a Slurpee) which in turn packs 444 calories and 26 teaspoons of sugar - the same number of calories as you'd find in 1.1 litres of Coke and the sugar of more than 10 Krispy Kreme original glazed doughnuts. 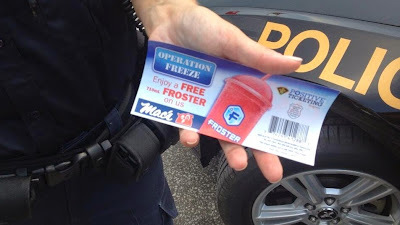 I completely understand the concept of "positive tickets", but the further normalization of junk food (and especially liquid candy) in Ontario's children's lives simply isn't positive. And honestly, how difficult would it be for the OPP to partner up with Ontario's municipal governments and instead of rewarding kids with sugar, instead reward them with free skates and swims at local arenas and pools?